Are you ever at a loss on how to get more people to read your words when you’re writing a blog post? It can be daunting to even think about it. 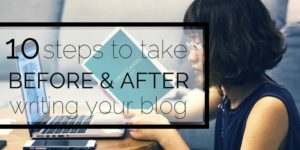 We broke it down and came up with a few tips on what to do before and after your hit publish to help you find – perhaps new – ways to get more followers on your blog. Copyblogger cites that titles follow the 80/20 rule: Eight of ten people will read a title, but just two of ten readers will continue reading the article. Make sure it targets a specific reader and includes key words. Links are a powerful tool. You should be using at least one link per hundred words. These can be internal links to your own website as well as external links to other sources. Also, remember to deep link to past posts – this is basically adding a link in your new post to previous posts to encourage maximum time on your website. Incorporating images into social media content has a significant impact. Twitter reports that images encourage retweets up to 150% while LinkedIn image posts get 98% more comments than those without. When posting your image on your side, make sure it’s optimised using alt text so that a description will automatically pop up when scrolling across it – great for social media share ability. Review your post for spelling and grammar issues – if you post without doing this and there are errors, you will immediately lose credibility, which is not what you want when you’ve just spent a substantial amount of time writing! Distribute your blog post across various social media platforms. Don’t forget to also use tools such as LinkedIn posts and remember to take advantage of specific social media groups you are part of. Repurpose your content by including your posts in your newsletter. You don’t have to include the entire blog, but the heading linked to your website should encourage more reads. Respond to comments and feedback quickly and capitalise on any engagement that the post generates. Try and keep the conversation going by including questions, further information, and other interesting and relevant information. Remember to always try and add value when responding. Review the success of your post by analysing your website metrics, and levels of social media engagement. Keep an on-going record so you can see which posts are the most popular – this will help with developing future blog post ideas. Take a quick video to capture the key points of your blog post. Videos are popular and highly shareable – by 2019, 80% of all Internet traffic will be video-based – and Google favours video-based content. You can also do this using Periscope.